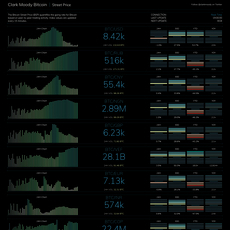 Cryptowatch is a visually stunning crypto data hub. 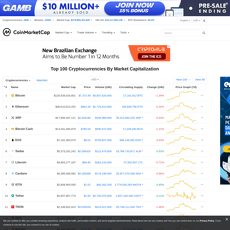 As soon as you enter the sight you will be bombarded with a block style design of the most popular cryptos, their respective charts and data, and market data. At the top, users may select from a drop-down menu which assets they would like to display. They may also select from a drop-down menu sorting filters and also different time frames. I did mention that the interface is beautiful, but I didn’t mention all of the options users have with it! From the top settings cog wheel, you have access to over 10 different themes and several visual modifiers. You can also add and detract market types, price metrics and other additional data points. In this same menu you can tailor the speed of refreshing the data. Multiple fiat currency options are available and cover USD, CNY, EUR, GBP, and JPY. Aside from that, there’s really nothing else to detail. The site is very user friendly and offers every several helpful data points about hundreds of currencies. 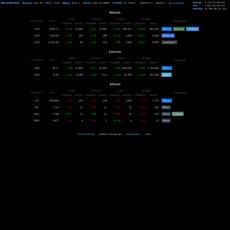 This is a great place to go if you just need a visually appealing method of tracking real time price data. 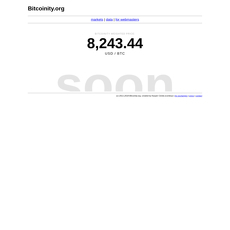 This would be a great website to leave up on your tv or monitor to look cool when your crypto friends come over for a visit. The display is stunning and offers a wide range of customizable options. 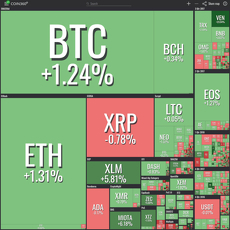 Tons of data is available on just about every cryptocurrency available. The main page with all of the updating graphs can take up a lot of CPU resources.